We all are thinking more about what we put into our mouths, even what we drink out of, but Tim Barklage and Kevin Tibbs of Better Life believe that we should start thinking more about what we clean with. In this interview, you’ll learn about how two lifelong friends worked to create green cleaning products that would be safe for their families. Three random commenters on this post will receive a gift bag filled with: What-EVER All-Purpose Spray, I Can See Clearly WOW Glass Cleaner, Even The Kitchen Sink Gentle Scrubber, and 2am Miracle Nursery Cleaner. I will draw the winner on Wednesday, October, 15. Update: The winners have been drawn, they are: Carli, Apple Blossom Designs, and Bender House. Tim and Kevin in Tim's kitchen. Tell me a little bit about Better Life. 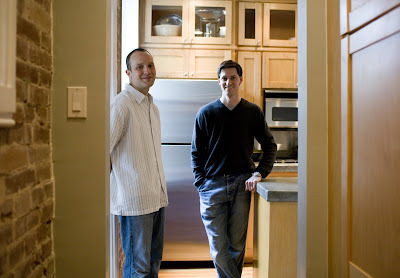 Tim: Kevin and I both live in old, old houses that we’ve spent a lot of time rehabbing. Because of that, we’ve spent a lot of time exposed to a lot of chemicals - trying to clean woodwork and all that stuff. It hit home to me that these things are really dangerous, because I could feel the physical repercussions of just short term intense exposure to them. 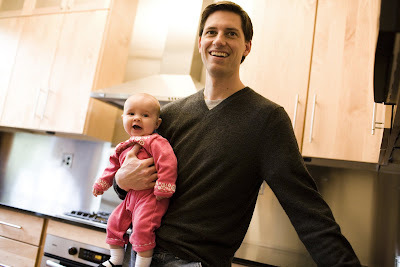 As time went on, we both had kids and were both complaining about the cleaning products, and Kevin said, "Well, I can make something better that’s better for the environment, better for people, and performs better." I said, "Well, go ahead and do it. Let’s make a business out of it. Let’s see what you’ve got." Fortunately, the prototypes that Kevin had made right off the bat were really good. We spent some time thinking about it and refining them and came up with some incredible products. We decided to create a business out of it. During that process, we recognized that we really didn’t have to compromise anything and we came up with our internal mantra of "people, planet, and performance" and the point of that is that they’re going to be the absolute healthiest products on the market for people. That includes not being exposed to toxins, having the ability to spray them on the surfaces you prepare food on, being able to spray them on the toys your babies and your infants use, the whole gamut. They have to be the absolute safest for the environment, meaning that they have to biodegrade extremely rapidly, and they have to not contain items which pose a threat to our environment (whether that be marine life or potentially down the road, how it would leech into our soils, and all the other things that petrochemicals do). Then, the performance. It’s pretty simple: it has to perform better than the natural products out there - but we didn’t stop there, we decided it has to perform equal to or better than the conventional or traditional cleaning products. I can confidently say that all of our products right now perform better than the traditional products that are out on the market and they’re incredibly safe and environmentally friendly as well. How did you develop the Better Life products? Kevin: I’ve been a formulation chemist for I guess over 12 years, but I specialized in skin care and personal care products. I’ve done all sorts of products that are out there on the market now: things that you can buy in large retailers and small boutiques. I’m responsible for a lot of those product formulas. Over the last three years, the trend towards sustainability, natural, or organic has been really strong, especially in the skin care market, which was kind of trending ahead of the other areas. People wanted very safe, natural, organic things to use for their skin care and personal care. So, I started specializing in that area. Around this time, as Tim mentioned, we were talking about not having a real solution for cleaning products and even some of the "green" products that were available on the market, we found, weren’t so "green" after all. We felt like there was an opportunity to provide the customer with a real solution. A lot of the technologies that I was using in skin care translated to cleaning because a lot of times cleaning products are in contact with your skin. The consumer deserves to have a safe product - whether it be a skin care product they put on their skin or a cleaning product that they use in their homes. With a lot of work and a lot of very creative chemistry, we developed this product line. Tim: I think one of the things that makes our approach a little unique is that Kevin’s got the very disciplined, scientific approach to solving problems, but he also has a spark of creativity - not even a spark, a raging flame of creativity that a lot of chemists probably don’t have. When we’re testing things and we’re approaching a problem, it’s not, "How do we solve this problem in the lab," it’s, "How do we solve this problem in our homes?" Then, we apply the scientific method to that as well. It’s kind of a different approach than probably a lot of people take to trying to solve a problem. I think it’s a pretty unique combination that a lot of people aren’t going to be able to say that they have. Plus, when we’re developing these products, we’re developing them. That’s a unique situation, I think. You know, other companies that are manufacturing products rely on a lab with people who are doing a wide variety of products. They’d say, "We want a cleaning product, and we want it to be green." What if their standards aren’t very high? I mean, they’re relying on somebody else to give them the product that they are marketing and selling. We don’t have to rely on anybody. We can develop these products ourselves to exceed all standards, and we can hold ourselves to them. Tim, while Kevin’s busy formulating and testing in the lab, what are you working on? Tim: I had spent over the last ten years or so working in a product development capacity, and I’ve also done sales and marketing and customer service as well in my career. So, I had a broad spectrum of business development and product development experience. We’re a good, compatible team. Kevin has the scientific knowledge and creativity in ways a lot of other scientists don’t possess, and I bring some sales and business development expertise into the picture. It’s a nice match. Are you guys still friends after all of this? Tim: Of course. We actually have grown up together. Kevin and I knew each other when we were kids and just happened to follow some separate paths for a while and then reconnected, but always have remained friends. Kevin: Almost more like brothers, I guess, rather than friends. Tim: The past seven years, we’ve actually lived on the same block. Our families are very close. Our wives are great friends. Our kids are friends. So, it’s fun. Kevin: And it’s easy to find him. Tim: Can’t get away from those midnight meetings. Kevin wanted to create a product that would be safe to have around his kids. What should a consumer look for to determine if a product that claims it is natural is actually natural? Kevin: Well, our products don’t contain petrochemicals at all. I can get into real specifics. We don’t contain ethoxylates, we don’t contain sulfates, we don’t contain monoethanolamines and diethanolamines. We can go on and on and on. These are materials that are probably not really responsible to have in your product. We don’t put them in our products. I think we’re probably the only ones that can say that about a lot of these items. Our products contain zero solvents and when we say zero solvents, we don’t even have alcohol in our products - which is really amazing and pretty ground-breaking in the industry. Yet the products still work, not just equally well, but better than the traditional products that are out there. Kevin: Well, solvents are volatile organic compounds and they’re released into the air. When you spray Windex on your windows, if it has alcohol, or ammonia, or glycol-ethers (all of the typical products do have these), whether you’re spraying it on your glass or your countertops, those volatile organic compounds are released right into the air that you breathe. They don’t dissipate. They stay in your homes - especially with them being so energy efficient these days. So, these things can trigger asthma attacks. They can trigger respiratory problems. They’re probably responsible for things we don’t even equate them with. I mean, it’s just if there’s a safer solution, why not use it? Tim: You know, I think all the studies that have been done on these are based on short term exposure, and those are scary enough. But, the real problem is what happens after being exposed to them for 20, 30, 15 years, whatever it may be. Kevin brought up a point that’s been really important for us, which is as a society we are trying to become more responsible by weather-proofing our houses, building green homes, just making things more energy efficient - not only our homes, but our office buildings. What happens is that the air in the house doesn’t recycle. The same air stays in there, so a lot of the studies that you read, they’ll say that the air, even in an urban area inside the home, sometimes contains two to three times more toxins than the air outside that you’re breathing. A lot of it is because of volatile organic compounds, like Kevin had mentioned, which are really prevalent in household cleaning products. They can really contribute to an unhealthy home. We’ve created something that contains none of those things. We didn’t make compromises and we won’t make compromises. How long did it take to create the products you have on the market now? Tim: We’ve been working at it for a long time. The company started at the end of 2007, but we had been playing around with (I shouldn’t say playing, but experimenting with) different things for some time before that. It was probably a four to five month process once we felt confident that our prototypes were very solid. Going through the process of bringing them to market was another six months or something of constant experimentation and redesigning. Kevin: I’ll start working on a product and it will come very easily. It’s like baking a new recipe. Sometimes, with certain ones, all stars align and it happens really quickly and easily. Other times, you just keep going at it and trying and trying and trying and trying and not giving up and it takes a little bit more time. Kevin: Once we have some prototypes that we feel are very stable (they meet all the criteria in terms of safety and environmental responsibility), then we start testing phases. We do lab testing, which is very important because that will give us early feedback in a very standardized environment. But, we are very interested also in real life testing. In the lab, you have standardized soils and they’re made with things like ink and peanut butter. All of these oddball items are blended together to create a standard soil. So, you test these different products against the standard soil and you get results. People in real life aren’t dealing with standard soil, lab soil. They’re dealing with everything. They’ve got dogs making a mess, cats making a mess, children, themselves, and a lot of different food products that are spilled on the countertops. You can have something that performs well in the lab and does awful in real life, so we want to cover both bases. We use beta testers who we’ll send the products out to and they give us non-biased feedback as to how the products work in real life. Then, of course, we have a lot of testing that’s done in third party labs for biodegradability profiles and toxicity profiles. Luckily, we both live in 19th century homes with small children and big dogs, so we get a lot of different types of stains that you can do some real world testing on. 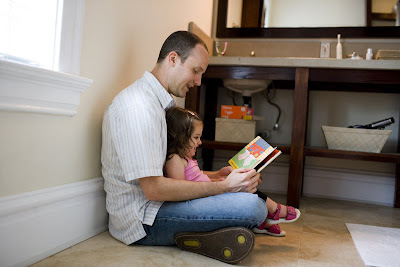 Tim and his daughter sitting on their clean bathroom floor. Let’s say I just finished baking cupcakes and my kitchen is a total disaster. I’ve got flour all over the place and grime on the cupcake tins. Walk me through how I would clean up my kitchen with your products. Tim: I’m a horribly messy cook. I’m a decent cook, but I’m horribly messy. It drives my wife crazy, so I guess I’ll take this question. 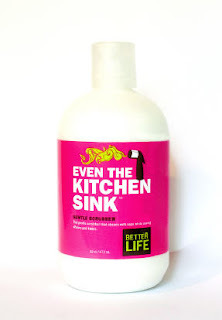 The best thing to use on the food prep surfaces is generally going to be our all-purpose What-EVER cleaner, so I’d use that for the countertops. I often get stuff on our cabinets, so I need to wipe those down as well. I’ll generally just spray everything down with our What-EVER all-purpose cleaner. Now, if you have a very shiny granite surface, like a true black granite surface, sometimes you might want to use our window cleaner because the window cleaner is going to be more of a streak-free type of finish, but the all-purpose cleaner has surfactants in it that will be able to break down a broader variety of soils. I have concrete countertops in my house, so I always use the What-EVER. Then, I generally have made a mess all over our stainless steel appliances, somehow, so I will use the I Can See Clearly glass cleaner to clean the surfaces of that - the oven glass and the inside of the microwave as well. Again, since all of these products are completely made from plant sources, they’re completely safe to use anywhere that you’re preparing food. You don’t have to worry about spraying inside your microwave and then worrying about the next time you turn the microwave on it doing something funky to all the chemicals that you had sprayed in there. One of the things that I really love is our product, Even The Kitchen Sink scrubber, which is a gentle, cream-based scrubber. It works really, really great on tough, baked-on, caked-on food, whether it’s in pots and pans or baking dishes, Corning Ware, or any of those types of items. It will take off either the grease or the baked-on flour or sugar-based spills that you might have on your baking-ware like nothing I’ve ever seen before. It’s also great on the kitchen sink after you’re all done with it. We have a stainless steel kitchen sink and it’s big and its deep and it drives my wife crazy because she would use something to clean it, and then the first time you turn your water on, it would get filmy or wouldn’t shine anymore. Kevin put a vegetable wax in there so that once you’re done scrubbing it and cleaning it (and it doesn’t require a whole lot of elbow grease to do it), it actually puts a protective wax on there so that it will keep the stainless steel shiny. The potential staining agent will repel on that instead of adhering to it right after you’ve cleaned it. So, your sink will stay nice and shiny for days. I have stainless steel pans as well and I use Even the Kitchen Sink all the time both on the inside of the pan and the outside of the pan and it does wonders with getting all that tough stuff. But, the last thing is that I always seem to get grease or something else, like on her tea kettle, when I’m cooking because that stays on the stove. It’s awesome for cleaning that too. It’s the only product I’ve ever used that’s been able to take that off of a tea kettle. Kevin: If you caramelize sugar on the pan, it’s just impossible to get that off. With Even The Kitchen Sink, you put it in there, scrub it in, and the pan looks brand new. Less elbow grease. Safer. Win for everybody. Tim: Before I had these products, I would try to use natural products, but the natural products just wouldn’t work with the way I cook and make a mess. I always just knew, deep down, that this is not good to use on your pots and your pans and your dishes and your food prep surfaces, and now there’s just a certain amount of liberation that comes from knowing that no matter how hard I clean, I don’t have to worry about what’s going to happen the next time around when I use those pots and pans or appliances. But, you don’t have a dish soap, do you? Tim: We don’t have a dish soap right now, no. We’re going to be releasing some new products coming up here soon. Kevin: Well, there’s going to be several that are kitchen-friendly. On our next round of products, we’re focusing on the kitchen area of the home. Those should be out sometime this Fall. Fabulous! Is the bottle Earth-friendly too? Kevin: Yeah, it’s a number two, which is high density poly-ethylene. There are two very heavily recycled packaging materials: one’s PET and one’s HDPE, so we’re in the HDPE. The nice thing about that is we’re able to put in post-consumer recycled content, so it’s very recyclable. Once the material is recycled, it can then go back into the bottles that we use. How difficult has it been to get your products on the market? Tim: As you can imagine, it’s a challenge when you’re dealing with entrenched competitors. I’d liken this to how organic food was looked at ten years ago, just something that a lot of the buyers and the grocery stores were viewing as an extremely narrow niche that they weren’t sure that they could make money on or not, with a couple of exceptions. I think that’s kind of where we are in the household cleaning area right now. I think that it’s going to absolutely explode in the next couple of years here and I think we got in at the right time where we’re gaining the momentum that we need right now and we’re establishing ourselves as a very credible, effective, innovative type of brand. I’m hoping that household cleaning products are going to be going the way that organic food exploded, and it’s already showing extremely high growth. Luckily, some of our competitors (which are absolutely massive in multi-national scope) are doing some of the education. I shouldn’t say for us, but they’re helping educate people that there is a better alternative and we view our product as a superior product, so hopefully, as people become more aware of the dangers of household cleaners, products like ours are really going to continue to grow at the rate that they have been for a long time. Kevin: I think it’s exciting. I love it. I feel like we’re the underdog compared to the large multi-nationals that Tim’s talking about. People think they only have one solution and here we are, we’re giving them what we feel is a better solution - an alternative to traditional or pseudo-green products. Our products are the real deal. Tim: That brings up another challenge. There are lots and lots of people who have already tried to make the jump over to a safe alternative. Now they’re disbelievers in the power of natural cleaning. And so, it’s not only convincing people that haven’t considered using a product to try an Earth-friendly product, but the really hard sell is the people who have tried to in the past and found that it didn’t work for them. Now, they think they have to use pretty harsh chemical cleansers to get the job done. We’re going to prove them wrong. Kevin: Tim, how many times has somebody looked at you when we said "streak-free glass cleaner" and said, "Oh, yeah, I don’t know about that." Then they’ll come back and email to the website, "You’re right! It is streak-free!" Tim: The response has been nothing short of phenomenal. It’s been everything that we hoped it would be once people get the products in their hands. We get unsolicited testimonial after unsolicited testimonial from people that have picked up our product and emailed us via our website just telling us how great it is. So, it’s been fun. Kevin: I would like to have a sit-down conversation with either Emeril or Jamie Oliver because I’m not as much of a cook as I’d like to be. I enjoy going in and making things up in the kitchen and using fresh, natural ingredients that you get from the farmers’ market. Jamie seems like he could really give me some good insight there. They both just seem like pretty fun, down-to-earth people that you could just talk to about cooking or their weekend out - just fun people to hang around with. Tim: I don’t know, this might not be what you want to hear, but I’m not going to name a specific person. I am not a baker by nature. I’ve always cooked just more along the lines of the appetizers and main courses and those types of things. There’s a lot of science behind baking and there’s a lot of knowledge that I would really like to gain from somebody chatting about that. Also, I’ve just recently become really enthralled with gourmet types of chocolate and just the amazing amount of variety and capacity for different complexities for flavor and that. It definitely is something I’d like to learn more about. Sounds like you want to interview me? Way to kiss-up to the interviewer! Tim: Yeah [laughs]. Maybe we need to sit down and just talk about that. Thanks to you all! I'm excited to hear that we have safe cleaning products that were developed here in the area. By the way, I love the three p's listed for 2am miracle on the webpage - that made me laugh out loud! Hmm... I want to try these. I wonder if they sell them at whole foods. are they selling them at whole foods nationally? I was just at Whole Foods and I only saw the "Kitchen Sink" cleaner. I've read about these guys before.. I can't remember where. I'm definitely going to try the whole line of products! 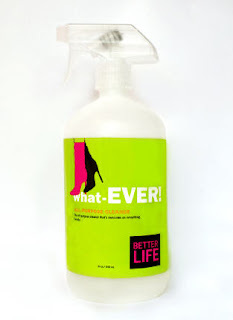 Here is the complete list of where you can buy Better Life: http://www.cleanhappens.com/wheretobuy.html . Unfortunately, they are not at Whole Foods nationally yet. However, you can buy the products online. Another great interview. I have tried a few natural cleaners-some good, some not so. I am going to look for these now. I hate cleaning! Perhaps this will help me feel a little more "zen" about the maddening never-ending process. As the mom of four kids five and under -- and whose youngest is just now crawling - safe cleaners are more and more important to me. I'd love to have cleaners that I could comfortably hand my girls to use when they help me do housework! And since my son is officially a "creeper" - his pee, poop and puke follow him wherever he goes...I need some of that 2am Miracle! I'll definitely be looking for these! I've been slowly replacing my cleaning products with more green ones. If this line will get rid of the ugly white stuff on the front of my fridge under the ice machine, I'm sold! Excellent interview. I haven't seen these products in stores near me, but I think I'll request that they be carried. I'm a chemist, and completely agree with the Kevin and Tim about the dangers of VOCs - it's good to know that their products can really clean your kitchen without slowly poisoning your family and pets. I'd love to try them! What a great article - and thanks to Stef for posting the website address, in case my local Whole Foods doesn't carry it! Kudos to you both, for coming up with this line; if it works as it sounds as if it does (some green products do, some don't), you'll have another faithful customer! i've got a toddler, a messy husband and two dogs and i am constantly searching for green products that work. it is so nice to see more of them appearing on the market and i will definitely have to check these out. thanks! These sound like products everyone should use!!! it's always great to hear when people are being positive, productive, and bettering the earth in the process. i'm pretty sure these supplies would put me in a better mood while cleaning! the names and labels are great! I've gotta start looking for these around here. I hate using harsh cleaners. Great interview, thanks for bringing this to my attention. love these products! and who couldn't love the product names! great job guys. These products sound great... Where can I buy them? I live in WAshington, DC. Wow, these are great products and an eye opening interview. Thanks for the story and the information. I hope these become the next must have products. What great products! I'm pregnant with my first child, and it has really made me look at what kinds of cleaners I use around the house. I've been trying to switch over now, because I don't like breathing in fumes of something that isn't safe! But these sound like they work great and they are safe! to SaraMeyerWalsh: You can buy Better Life products at Ace Hardware in Washington, D.C. area. I think there's a link on cleanhappens.com. Also you can buy online! Thanks so much for your nice comments! This is Tim from Better Life. Really appreciate all the kind words, we are so excited to give away some product to the lucky few who win them. For those of you who do not win, check out the 'Where to Buy' section of the website at cleanhappens.com Always free to send any questions my way as well. Thanks much! Where can we find the products? I've tried replacing some of my cleaning products but I end up stuck in the option problem aisle. I live in a big city and our local grocery store is small. The best I can come by is the Clorox line of natural products but I know they are still harmful. I hope to run into these products soon because I will buy them up. I will see if they are available at World Market or Trader Joes. Thanks for the great interview. Oh we are in the process of buying our first home and I would love to use as many safe cleaning products as possible from the get-go. Great interview very informative. i will be looking for your products! These look like great products and I loved the interview. What a great review! I'm always looking for new green products and new ideas for going greener. Thanks for the great review and giveaway! I am a mom of a teenager (dirty), a toddler (hand prints all over the place and everything goes in the mouth) and a newborn (in 2 weeks). Clean is something I strive for (rarely achieve) and these things sound awesome. fabulous!!! I want to try!!!!! Sounds like interesting products. I'd like o try. What a great interview; I'd love to try the products. It is always great to hear about new safe cleaning products. It is wonder that more manufacturers aren't moving away from petrochemicals. Thanks for the giveaway. I've been wanting to try new safe cleaning products both for my kids and for the environment. These sound great! My friends calls me a cleaning freak because I will reject invitations to stay home and clean.. It will be really nice to not have to breath in the scary smell of regular cleaning product.. Sounds like some great products. I would love to try these. These products sound really great, something I would feel comfortable using around my kids. Looks like great products. Better for us and for the environment. I'd love to try these! They sound great. Wow I would really love to try these products, they sound great. I love trying new cleaners that are safe for me and my children! These look great! The names and the design make them amazing-besides the fact that they are green! I'd love to try them out. Thanks!! I am excited to hear about your products. I have a 1yr old who is into everything and always seems to be under foot while I am trying to clean. I am in search of safer cleaning products so he and my family won't be inhaling all the toxins!! Thank you so much for creating these!! It's always so inspiration to hear about parentpreneuers! Way to go, Tim and Kevin - we'll be on the look out for their products! Love the names of the products. I've been replacing my cleaning products slowly but surely. I hadn't heard of these products before but am very interested. Thanks for the great giveaway! Sounds like some great green products that will be hitting my area soon. I can't wait! Fun review! Informative and entertaining. Nice giveaway. I'm always looking for good-quality green cleaning products, especially since my cat has asthma (no kidding) and I don't like to spray all the chemicals around him. Great blog and great interview! I will have to look for these products at Whole Foods! I'd love to use these. I'd love to try your products! I'm sensitive to many products, especially the fumes, and am always looking for products that clean well but don't irritate. I wish you much success with this! Your products look "right up my alley"! I love to use natural stuff to clean with, especially having 4 boys to clean up after. It's safer. 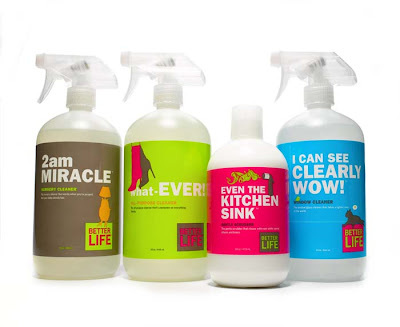 Love the creative, clever titles of these cleaning products! I'd love a chance to win. Thanks! ive heard of these products but have yet to try them...i'd love to though! Thanks for sharing the interview too, always nice to know the story behind stuff like this! I will look for them next time I am at WF. Very clever names for the products. I'd love to give them a try. Vinegar and baking soda get old after a while! Thank you for a very interesting and informative interview. The products sound awesome!!! I LOVE the names too! They are so much fun and very unique. The bottles look huge too! the names! Too funny. I'd love to try these out. Great interview! i am definitely concerned about chemicals in household cleaning products. Especially since I have a baby in the house. This stuff looks so great! THis is fantastic, I must admit, I'm swooning over Kevin and Tim. Fantastic parents and entrepreneurs. good luck to you. thanks for the give away. I would really like to try these natural products! Sounds great, all the cleaning companies are 'getting green' in a real hurry. This does it for me much more. I have seen you in Whole foods, but only in s larger store (not my local). THanks for the sweeps, I am a green cleaning fan. I usually use Ecover to be honest as they're cheap but don't always get the tough jobs done. I would love to try these. thank you much. These sound like really wonderful products! And what clever names they have! There are so many natural cleaners that just don't perform well, I would love to try these out! clever packaging, safe products for keeping my home clean. awesome! i'm looking forward to trying them and comparing them to other safe cleaners...some brands work alright...others not so effective. I love the packaging- eco friendly and cool! Great idea guys! I'm in love with these products! If Whole Foods sells them I'm getting them this weekend! wonderful! Not all natural cleaning products work so this is a fantastic !!! I will give these a shot! And the personality they show makes them a lot more appealing! I would love to try these cleaning products, Never heard of them before! Thanks for the interview too. Always looking for new ways to do the right thing for the environment...and what fun names and packaging! Awesome! I'd love to try these. I've been wanting to green up my cleaning closet, but wasn't sure where to begin. These sound great! These products all sound WONDERFUL and I hope they get picked up by "regular" retailers as well. It's so much easier to "clean green" when the products actually WORK. I would LOVE, LOVE, LOVE to win this package! I've been consciously going green with my bags and bottles, and my cleaning supplies are next on the list - these sound awesome! These products sound so great and love the names of them as well. Thanks for the chance to win! These products sound great, I love that they are safe around kids! Thank you! This was a great post! Thanks for the great giveaway to go with it. I'd love to give these a try. Thanks! I would love to try these out, they look nice, too, making cleaning more fun! 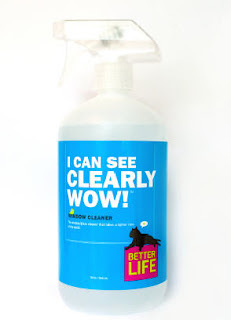 If you've ever stood inside your shower with the doors closed and tried to breathe while cleaning with any glass cleaner....you'll LOVE "I Can See Clearly Wow". I used it and there were no fumes, no smell and it worked immediately. No streaks, just completely clean doors. WOW! i would love to try these - I have been using up the last of my "bad" cleaners and have been replacing with green ones. I will keep this on my list to look out for! I have been making the switch to greener products and I run out of stuff and as my light bulbs expire. These product would be great around my kids. I am always up for trying some new Safe cleaning products. These look like these guys really put their thought and hearts into it. I like the name of I can see clearly, Wow. How clever. What's not to like!? Sounds excellent all 'round. Huzzah!!! I'll be keeping my eyes peeled for your products; can't wait to try them. I really like the 2am miracle. Sounds like some great products. Thanks for the giveaway. With a toddler in the house, safe cleansers are really important to me. These sound terrific - thank you. these sound like fantastic products. I'd love to try them! It's really great to see more natural and environmentally friendly products out on the market, keep getting your message out there to the masses! Thanks for the fabulous interview. I loved reading about how the product was developed. I am trying to go greener with my cleaning products but always yearn for more information. I need to know that I can trust the labels I buy! Sounds like you have created some great products. I would really like to try them. Thanks to Stef for posting the link to where to buy the products. I could have used these when I was pregnant. It was so hard to clean with the noxious junk products we had. I try to use natural stuff now as much as possible to keep my daughter safe. Everything goes in her mouth! Excellent, I am so stoked to start trying some things like this. Love it! Excellent! I love the product design! I'd love to try this. Thanks so much for the chance! Great interview, I'd love the chance to try out the products. I would love the chance to try these products. Thanks for the opportunity! Thanks for the info! I have two boys and am looking to move away from harsh cleaners to something more natural! Would love to try this, I am using Shaklee stuff now, but am not totally happy with it. Awesome interview! I only use "green" cleaning products now that we have my son! I didn't see them at WF today? I'd love to try your products, but we don't even have whole foods around here yet. these products sound great and green!!! Would love to try them and GO GREEN!! I'm always on the lookout to support small businesses- when they make products that are eco-friendly and kid-safe- it's a win-win! If you see my post from today, you should see why I need to win this :). I would LOVE these!!!!! My email is sarahw56 (@) gmail.com, but I will check back to see if I won!!!! !